A light bridge at the entrance to the Ark's Citadel. "I’m showing a lot of photonic activity. The excited photons have displaced the air around the light path." "Which means that the light has become coherent. Solid." Light bridges are examples of advanced Forerunner technology. Using the Forerunners' ubiquitous hard light technology to function, they are composed entirely of solidified light and act as substitutes to physical bridges in certain areas. As a result of their temporary nature, they are often employed as a security measure. There are usually two components to a light bridge: a control panel, and the light emitters. The control panel is a semi-translucent holographic array of Forerunner symbols and glyphs that are projected over the surface of a pedestal. Though a variety of control panel configurations have been observed, in the case of one of the light bridges on Installation 04, tapping the "blue-green circle" activated the light emitters. A cascade of coherent, high-energy photons are emitted through the air, generating a visible, horizontal band of light. Through unspecified physics, the coherent band of light interacts with the illuminated air, and pushes aside the air within and around it it, becoming a firm, solid mass capable of supporting extremely heavy weights, ranging from an M12 Warthog LRV to several M808B Scorpion MBTs. When damaged, the emitters flicker on and off, causing the light bridge to flicker, creating a less stable force. Light bridges are commonly seen on most Forerunner constructs. The Forerunner complex on Harvest featured light bridges crossing over a series of chasms surrounding the center of the main chamber. These were used by the UNSC forces as they made their way in and out of the facility during the Harvest Campaign in 2531. The Etran Harborage, discovered by the UNSC Spirit of Fire in the same year, had a multitude of light bridges to span chasms within its interior. Unlike most light bridges encountered by the UNSC, which manifested as simple beams of blue-white light, these light bridges featured arrangements of lines forming symmetrical, geometric patterns characteristic of Forerunner art and architecture. Light bridges were used by John-117 during the UNSC's operations on the surface of Installation 04, in the subterranean complexes and the Flood containment facility. Though mainly unseen on Installation 05, they were also present on the Ark, again in a subterranean area, and another one at the entrance to the Citadel near the Ark's Core. Light bridges were also present on X50; some of these bridges were crossed by Spartan Sarah Palmer during the Battle of Draetheus V. The Prometheans' shield installation Requiem and the Didact's ship, Mantle's Approach, also contained a great amount of light bridges. During the New Phoenix Incident, Cortana and several of her rampant copies were able to manifest hard light holograms of themselves from a light bridge and create hard light shackles that temporarily bound the Didact. The Master Chief using a control panel that activates the light bridge on Installation 04. 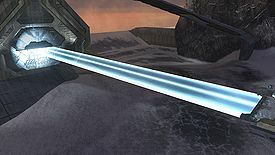 A light bridge as part of an underground tunnel network on Installation 04 in Halo: Combat Evolved. The light bridge in the Relic in Halo Wars. The remastered light bridge on Installation 04 in Halo: Combat Evolved Anniversary. A light bridge on the Mantle's Approach above a slipspace rupture in Halo 4. A light bridge on Installation 00 in Halo Wars 2. ↑ Halo: Evolutions - Essential Tales of the Halo Universe, "Wages of Sin"